Once I dreamed a dream of being an evolutionary biologist. As I imagined it, I would hang out in a natural history museum, comparing fossils to one another, taking notes on the minute differences, and piecing together the history of life. 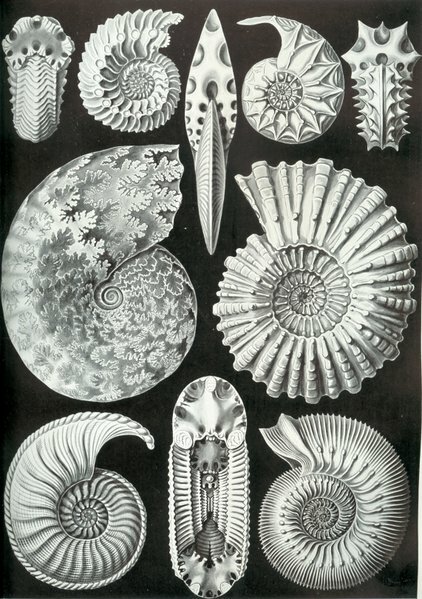 It wasn’t until a job fair years ago, when I babbled to an evolutionary biologist about morphologies, collecting specimens, and, pretty much word for word, “working in a dusty basement full of drawers of fossils,” that I realized it was an unlikely future. The scientist looked at me like I was nuts: “Um… that’s not really what I do. I work with DNA and genomes.” I pushed him further, but his answer was clear: The job I described did not exist anymore. But while the job does not exist (or is a rare find at best), the specimens do. There are still huge archives at museums stuffed with bones, skins, ad infinitum. I am fortunate to have a friend who works at the American Museum of Natural History in New York in the mammals department. When I visited Catherine back in October, she was spending most of her time with the bat specimens, ensuring that they were in proper order and condition. She gave me a tour of the place and I was blown away: I had always dreamed of walking into a room, stacked ceiling to floor with hippo skulls, and there I was! Catherine showed me the cleaning rooms, where fresh skeletons are picked clean by flesh-eating beetles; slid open a case in which hung tiger skins, as if it were her coat closet; and, by far my favorite, the marine mammal room, with massive whale vertebrae lined up on shelves. It’s funny to imagine a whale complaining of back pain, but there was even a pair of calcified vertebrae among the bunch. After walking through the maze of rooms and seeing this vast collection with my own eyes, I couldn’t help but wonder: What are these even used for anymore? Certainly, education, but the museum was already packed with skeletons and stuffed animals without this backup. Catherine told me that sometimes researchers try to extract DNA from specimens, but that purpose alone doesn’t seem to make the best use of this huge collection. If taxonomy is now prescribed by genomics, are these collections, compiled and curated over centuries, going to waste? In the past couple months, I stumbled upon three papers describing three different ways that these collections can be used to study ECOLOGY! (O, be still, my heart!) The first, in Marine Ecology, online on Feburary 16, 2011, argues for the use of natural history collections to inform us about past species assemblages of areas that haven’t been heavily studied — baseline data. The researchers used Saba Bank, a reef in the Caribbean Netherlands, as a case study, studying coral specimens collected by divers in 1972. In this older collection, there were five species of corals collected that are no longer found in Saba Bank, suggesting that this understudied reef may need greater protection. This may seem like an obvious use – but the authors note that it’s relatively unexploited. This may be because of poor record keeping, or the difficulty of locating collections from a specific area that have been shipped off to another museum. Another problem is that, if earlier sampling methods weren’t written down, it’s hard to know how representative a collection is of the area. Divers, not scientists, collected the Saba Bank specimens, so they may not have been trying to take note of all the species there at the time. But finding five species that survived there previously but don’t now is very useful information, no matter the completeness of the collection. Certain organisms can provide information about their growth through growth rings, which makes their presence in natural history collections useful for learning about environmental conditions. Robert Scott is remembered for failing to reach the South Pole before Roald Amundsen – and part of the reason he was so slow is that he was so busy collecting specimens and taking measurements for SCIENCE. During his 1901 and 1913 expeditions, Scott collected Cellarinella nutti, a bryozoan that develops growth rings. Because this species was collected throughout the twentieth century, scientists were able to date the rings based on collection date, and create a timeline of relative growth: did the bryozoans grow significantly more in one decade than another? The scientists found no change in growth between 1890 and 1970, but a sharp increase since the 1990s, as they published in Current Biology on February 22, 2011. 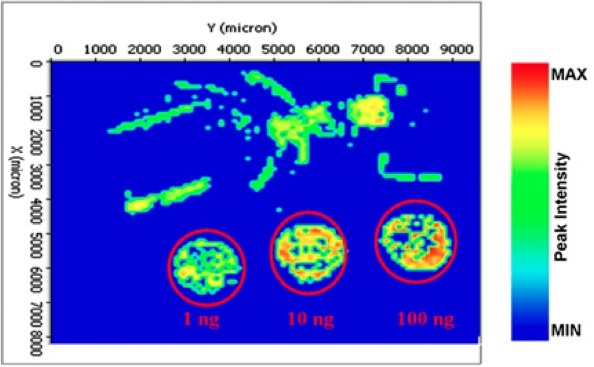 Based on studies in related species, they think that this growth acceleration is either related to (a) greater production of phytoplankton, the food chain base or (b) a switch in the dominant species of phytoplankton, which could alternatively be more nutritious, speeding their growth. If they’re correct, it means that these museum specimens provide evidence for a recent increase in carbon storage on the seafloor in the Antarctic. Natural history specimens can also be useful for tracking the development of disease in an animal population. Avian pox is caused by a DNA virus (the aptly named Avipoxvirus) that causes lesions either externally, on feather-free areas, or internally, in the mouth, windpipe and lungs. Beyond the metabolically draining effects of the virus, the pox symptoms can cause trouble feeding, cleaning and breathing. The virus is carried by mosquitoes and has been linked to the extinction of Hawaiian bird species. Avian pox has been identified recently in the Galapagos islands, affecting mockingbird, warbler, and finch species that are only found there. To figure out when the virus arrived to help trace the progression of the infection, scientists used natural history specimens. Digging through past collections, the researchers selected birds with lesions like those found on avian pox victims, and looked for viral DNA to confirm that these lesions were caused by the virus. Their research, published on January 13, 2011 in PLoS ONE, reports the earliest specimen with avian pox they found was infected in 1898, and that the infections generally followed the pattern of human colonization. This suggests that the virus has been spread not by mosquitoes moving between islands, but by chickens and other pox-carrying fowl brought by settlers. These perhaps unexpected uses for natural history collections — to reconstruct species assemblages, extrapolate climatic or ecological variability reflecting growth, or trace a disease through a population — should force scientists to rethink their collection methods. Historically, these collections were created to answer a simple question: What species are out there? As a December 2010 paper in the American Journal of Botany notes (hat tip to Colin Schultz), this mindset often leads to (a) oversampling of rare species, as just one or two specimens can misrepresent their abundance proportionally and (b) undersampling of common species, since just a couple specimens will do. But gathering fully representational collections is easier said than done. These are real people out in the field, digging in the dirt or seafloor and may not have the space or energy to haul back many examples of a single species. Plus, you can go too far in the other direction; there is also no need to destroy the ecosystem for the sake of fair sampling! But it does make clear that the age of DNA and genomics does not exclude the need for sampling. To ensure that past collections remain useful as ecological tools, scientists need to keep sampling for the sake of future science. In 2005, a group of scientists from La Trobe University in Australia investigated how species will adapt to global warming by studying a species of rainforest fly, Drosophila birchii (later published in Science). 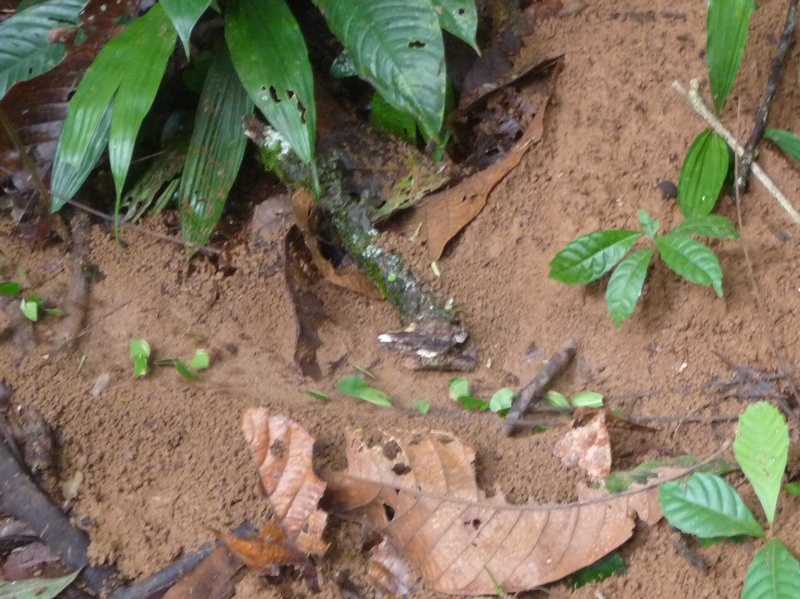 Increased temperatures may lead to drier conditions in rainforests, so the authors wanted to see how quickly this fly could adapt and develop resistance to desiccation. As in many directed evolution experiments, they took the flies to a lab and exposed them to dry conditions, with most of the flies unable to survive the dryness. The survivors were then bred to one another. Thus generation after generation, only the most desiccation resistant flies would survive, resulting in a population that could survive dry conditions potentially induced by global warming. Right? Well, that was the idea at least. At first, their population of flies did show a bit of increased resistance. However, in the proceeding 28 generations of selection, there was no increased resistance to desiccation, despite that previous papers had found increased resistance in 3 other Drosophila species. Drosophila birchii was unable to adapt to these conditions. What went wrong? Natural selection itself is based on three assumptions in a population. The first is that there will be variation in traits, such as multiple colors of eyes or hair. The second is that these traits be heritable through the generations, that children will inherit the traits of their parents. The third is that these variable traits have differential fitness, or that some versions of a trait might help you survive better than another. Thus certain trait variants will help its carrier organism survive better, passing that trait to its offspring which will in turn bear this trait. In order for populations to adapt by natural selection, these three requirements must be fulfilled. When a biologist sees any population, he or she typically assumes that these they are met, and I can’t really blame them. All cellular life we know of on this planet has a hereditary mechanism, the gene, which has differential fitness depending on the variation, thus meeting requirements two and three. The idea here is that at any point in a healthy population, there will be many variants of genes in the population, which are replenished infrequently by new mutations. Thus, when selective pressures come around, there is a full stock of variants to differentially survive and lead to new adaptations. This is why small populations and inbreeding are considered such problems: the small gene pool means fewer gene variants and an increased inability to adapt to new conditions. But why should this have to be true? Is a lab-bred stock of Drosophila really enough to show that there is variation in natural populations, when the lab has a completely different set of selective pressures? When the researchers studying the rainforest Drosophila birchii analyzed the genetic diversity of their collected populations, they found very low variation in the desiccation gene group compared to other genes in the population such as wing size. This lack of variation prevented the flies from adapting to new conditions – though the researchers weren’t sure why. Perhaps these dessication genes had (relatively) recently been under selective pressure, and had not had time to reconstitute the genetic diversity in the population. Unfortunately, there are very few studies of this kind so it’s hard to draw any conclusions. After all, people studying evolution usually want to study EVOLUTION IN ACTION and not evolution when it doesn’t happen. I suspect that past experiments that have found low genetic diversity have been tossed simply because it seems less interesting evolutionarily – when maybe it is in fact more interesting. This would be a form of selection bias: the choice of study populations or species unconsciously (or consciously) swayed by the desired outcome of EVOLUTION IN ACTION. In his 1991 Croonian Lecture at the at the Royal Society, Anthony Bradshaw gave a compelling example of this sort of selection bias in evolutionary studies (published here). In Prescot, Merseyside, a copper refinery opened up next to a meadow that had many species of grasses and wildflowers. Over time, the soil was contaminated by copper, killing off many of the plants. However, after 70 years, there were 5 species that were still able to thrive in these meadows! They had adapted and developed a resistance to copper. Even now I’m thinking to myself, “oh! cool! How did they adapt that way? How did that mechanism work? How quickly did the resistance gene spread?” etc. But what I’m forgetting is that, while five species did adapt, twenty-one species failed to adapt. If there really was massive diversity at all genes in each population, you would think that at least one would confer some benefit to survive the copper. But this did not happen: twenty-one species went locally extinct. Just as interesting a question as “How did these 5 adapt?” is “Why did these 21 fail to adapt?” But it’s a question that’s only begun to be reconsidered. Death and extinction are far more powerful forces in shaping the whole of biodiversity on our planet than successful adaptation, but these evolutionary failures that occur all around us are little studied. Especially as we anticipate global climate change causing unknown impacts on species worldwide, we should be studying non-evolution to get a better sense of what natural genetic variation actually looks like and what we may be facing in the future. Today I bring you something extra special: A guest post from Lucas Brouwers of the world-famous blog Thoughtomics. He loves genomes, I love plankton, and you get a great story involving spaceships, genomic party crashers, and, of course, a planktonic sea squirt. Enjoy! Just below the surface of the sea, little animals are floating through a universe where the stars are made of plankton. They travel in what can best be described as gelatinous spaceships, which provide both shelter and food. They are Oikopleura dioica (Oikos is ancient Greek for house or household). Their spaceships are ingenious constructions, made in such a way that every beat of Oikopleura‘s tail brings in a new flow water. The water and all the plankton it contains, is led through different tubings and chambers of the ship, until it reaches the waiting mouths of Oikopleura. The spaceships are not of a durable design and last for only a couple of hours before they are broken down again. Oikopleura spend the largest part of their short lives (5-10 days) repeating a cycle of building, feeding and destruction. Oikopleura in its gelatinous house. As small and short-lived as they may be, their genomes are evolving at at an extraordinary speed. A large team of scientists sequenced the full genome of Oikopleura recently, and found that its genome has been reorganized and trimmed down on an unprecedented scale. One of the first things they noticed was the rapid evolution of introns in the genes of Oikopleura. Introns are the genetic equivalent of party crashers who show up at parties uninvited. They hang around inside genes, without coding for anything. Our cell have to force the introns out of messenger RNAs before they can properly be translated into proteins. Despite their apparent lack of use, many genes of distantly related animals have introns in exactly the same places. These introns have been conserved for millions of years, leading some to believe that they provide an evolutionary advantage somehow. Oikopleura doesn’t care about these million year old traditions though. A staggering 76,2% (or 4.260) of its introns are unique to Oikopleura. Conversely, 3.917 of introns that are present in other animals (including close relatives) have been lost in Oikopleura. Not only do the newer introns outnumber their older peers, they are also good deal shorter than the few introns that have been retained. But the extensive remodeling of the genome didn’t stop with introns. Normally, genes tend to hang out in similar neighborhoods in different species. There’s a good chance that two genes that are close to one another in mouse, are also close together in the human genome for example. Just like introns, many of these neighborhood relationships have persisted in species that are as far apart as humans and sponges. Not so in Oikopleura. Its genes have been shuffled and switched around until the point that conventional gene orders are no longer recognizable. For small sets of genes the gene order in Oikopleura is closer to random than the gene order in other species. The authors subtly hint at a potential cause for all this genetic upheaval: Oikopleura‘s genome lacks a full set of DNA repair genes. DNA is a robust molecule, but it can still be damaged. One of the nastier things that can happen is that both DNA strands of a single chromosome break. Cells can repair this type of damage in two different ways. The first way of repair works by taking a close look at the sister chromosome, and see how the damaged strands should be repaired, as shown in the video below. Another way is to directly seal the broken ends. Oikopleura is lacking the genes for this last type of repair work. This means that every double strand break in Oikopleura‘s DNA can only be repaired via a sister chromosome, increasing the recombination rates (the exchange of genetic material between chromosomes) for Oikopleura. The causal link between the missing DNA repair genes and the accelerated evolution of Oikopleura‘s genome remains to be proven, but it isn’t hard to imagine how their absence could have played a large role in the overhaul of genomic architecture. In addition to having a fast evolving genome, Oikopleura also has one of the smallest animal genomes (70 MB, compared to 3,174 MB for humans), which still contains some 18,000 genes (compared to ~21,000 in humans). Clearly, we don’t need that extra 3,100 MB for only a couple of thousand genes more. Compared to Oikopleura, our genomes are like attics crammed full of boxes and old furniture. Some scientists think that many features of our genomes (such as introns) are quite unnecessary, while others disagree. The debate boils down to this: are we keeping all the stuff because it is worth a lot, or because we never got around to throwing all the junk away? Since Oikopleura was successful in redecorating and cleaning out its entire genome, our conserved genomic architecture might be nothing more than a product of historical contingency. In the small and slowly reproducing human population, natural selection might not be strong enough to remove all the unnecessary junk. Despite the large genomic changes, Oikopleura has remained an animal in every way. While it might not be immediately obvious, they are very closely related to us vertebrates (animals that carry a backbone such as fish, reptiles, birds and mammals). They don’t have a spine, but they do have a lining of tough cells (a notochord) and a neural tube running through their entire bodies. A juvenile Oikopleura Dioica. Notice the vertebrate-like appearance, Oikopleura has a notochord, nerve cord, separate head and tail. Oikopleura belongs to a group of animals known as tunicates, or sea squirts. Most sea squirts live a sedentary life on the ocean floor where they filter plankton from seawater. They are basically hollow bags with two siphons – one for drawing seawater in, and the other to expel waste and water. But the solitary and free swimming Oikopleura don’t look anything like these stationary creatures, so what are these familial ties based on? A different life stage holds the answer: every sea squirt starts its life as a larvae, looking very much like Oikopleura. After swimming around for a couple of days the larvae attach themselves to a comfortable looking outcropping and morph into the sedentary sea squirts. By retaining its larval features and delaying its further development, the ancestor of Oikopleura has permanently avoided the fate of settling down (these processes are known as neoteny and progenesis). The similarity between vertebrates and sea squirt larvae implies that our own vertebrate ancestor once looked very much like larvaceans such as Oikopleura. Like Oikopleura, we are basically sea squirts that have never grown up. But unlike them, we still carry the baggage of 600 million years of animal evolution. I think there is much that we can still learn from the Peter Pans of the oceans. Source for picture 1 and 2. Eutrophication has gained a pretty bad reputation considering that it is a natural process. The word itself comes from the Greek “eutrophia” which means “healthy” and simply means the addition of nutrients into an ecosystem encouraging plant growth. Of course, there’s good reason why eutrophication has such negative connotations these days. Since the industrial revolution, the amount of fertilizing nutrients, particularly nitrogen and phosphorus, entering ecosystems from runoff has doubled. Just like your mother told you, too much of a good thing can be bad: too much nitrogen cause unlimited plant, algal, or phytoplanktonic growth. When these organisms die, their decomposition uses up an incredible amount of oxygen, creating areas where these is little (hypoxic) or no (anoxic) oxygen. One of the most famous areas for this overgrowth leading to hypoxia from eutrophication is the Gulf of Mexico dead zone, which is 6000-7000 square miles! Satellite image of the northern Gulf of Mexico/Mississippi Delta showing hypoxic coastal water (light blue). This color change is due to excessive nutrients being washed into the sea. Source: Jacques Descloitres, MODIS Land Rapid Response Team, NASA/GSFC, January 2003. But this is not necessarily how the story always ends. A little bit of fertilizer runoff can actually fertilize natural ecosystems. This typically increases the growth of plants or other photosynthetic organisms, whose growth is normally limited by the scarcity of nitrogen and phosphorus. When there are more plants, there is more energy available to herbivores and, in turn, omnivores and carnivores, altering the food web. So – as you can guess – we are very interested in studying how these food webs are changed, and how the fertilizer runoff from human activities alters the structure of communities. One effect frequently seen is that the increase in nutrients allows rarer plant species the opportunity to grow. This increase in plant diversity leads to a greater diversity of herbivores, since herbivores that only feed on one type of plant are drawn in. Thus this increase in diversity of species can ripple throughout the system. One question that ecologists have been asking is how a pure plant biomass increase would effect the diversity of herbivores, omnivores and carnivores in an ecosystem. That is – not an increase in plant diversity, but a simple increase in the amount of food available. This is a harder question to study than you might think. Most ecosystems are diverse to start, and the rarer species with greater nutrient requirements are always looking for a way to wiggle their way in to grow and reproduce. Spartina alterniflora-dominated salt marsh at College Creek in James City County (Colonial National Historical Park). Photo: Irvine Wilson / © DCR Natural Heritage. A recent study in Ecology features some beautiful experiments that do a great job addressing this question. Gina Wimp and her crew studied a salt marsh on the coast of Tuckerton, NJ. Salt marshes are usually a monoculture: they only have one species of plant growing, a grass called Spartina alterniflora. Not only is it a monoculture, but just one plant! This grass species has a rhizomal root system, which can spread its roots underneath the soil and shoot up new stalks where it can find the resources and space. So in miles of salt marsh, you will often find a single organism. Pretty amazing! What did they find? Well, to start off, they did find significantly greater growth of Spartina in the fertilized plots, and it remained a monoculture, confirming what we already thought we knew. (Phew!) In the fertilized plots, they found not only more insects living on the grass, but a greater diversity of species, as you can see in the figure below. The asterisks above the sampling date show that there was a significant difference between each nitrogen treatment – that is, the different in number of insects was large and consistent enough that it was not due to chance. AND! On top of that, the actual communities of insects were also significantly different. In summary: the increase in the amount of plant biomass alone (through fertilization) not only increased the number of insects and the number of different species sequentially, but also the relative abundances of each of those species to one another. WHOAA! What does this mean really? Most of the focus on overfertilization from runoff has been on these dead zones and areas of hypereutrophication that I discussed earlier. But this study shows that, even when plant diversity is unaffected, the addition of nitrogen and phosphorus affects not only plant growth, but what species are living in an area and how many of each are around. That is: we are changing entire ecological communities. On one hand, this seems like a good thing. When a little bit of fertilizer reaches ecosystems, there is an increase in production and an overall increase in biodiversity, which we generally agree is a good thing. But the problem with changing the structure of a community and even altering its food web is the potentially for causing a fundamental change in an ecosystem itself. Seems like a strange concept – but what if the increase in growth brings in an organisms that somehow disrupts the growth of Spartina in the first place? Then, while we temporarily have a buzzing, diverse community of organisms, the initial community could be lost, decreasing overall biodiversity. I’m not trying to scare you or be a fearmongerer: but these are the extreme questions we have to ask when contemplating how our actions are influencing the typically balanced communities of organisms that surround us. This truly beautifully-designed study gives us the information that communities can change just from more food resources being available. And we can use this information to help regulate agriculture and prevent vast ecological changes from occurring that could be detrimental to the organisms, and us, in the end. There are under 200 California condors alive in the wild. There are under 600 wild Ethiopian wolves. There are around 3500 wild tigers and under 5500 African wild dogs outside of zoos. It has been ingrained in all of us that these are fearsome facts, that the very low population of a species means they are close to extinction (and with good reason). But when you think about what this means – that a smaller population is less able to recover and grow in size – it doesn’t make perfect sense at first. A small population should have more resources available for each individual because there is less competition within the species. Additionally, there should be overall less predation on a lower population because, in a simplified model, this population will support fewer predators, and the predators are less likely to preferentially seek out a scarce animal in favor of other prey. (For a primer on population ecology, check out this one I wrote up here.) Why shouldn’t the animals be able to reproduce and increase the size of their population? Despite these caveats, we see the pattern repeat itself: when a population of a species gets small enough, it seems to get stuck there, unable to recover its numbers. Instead, it continues to shrink. What is the cause of this? In the 1930s to 1950s, an ecologist named Warder Cylde Allee described what was known afterwards as the Allee effect, this pattern of a decrease in the per capita reproductive rate in a species when the population gets to be too small. Of course, “too small” is a variable number depending on the species and its life history traits, such as feeding preferences, natural range, and social behavior. This is a notably difficult theory to study because it requires a foresight that we lack. Identifying a species that is already at a critically low population isn’t enough. To provide evidence for the Allee effect, scientists need to identify a threatened population before it becomes threatened in order to collect data on its range, foraging behavior, and social activity, and compare these data to similar traits when the population has gotten “too small.” But if we had this sort of foresight, we hopefully would put in enough effort to prevent the population from dropping in the first place. I am sorry to report that such a species has been identified, one that is on the brink of extinction: the Vancouver Island Marmot. This large rodent (5-7 kg! 70 cm long!) is geographically restricted to Vancouver Island, and evolved rapidly after its arrival after glacial retreat 10,000 years ago. It is an herbivore and lives in large burrowing colonies. The cause of their population drop (from 300 animals in the 1980s to 25 (25!) in 2001) is not entirely clear, but is thought to be associated with increased logging. A possible cause is that the clearcut forest from logging looked like prime meadow for setting up colonies, but the quick regrowth of these forests uprooted the colonies, scattering the animals. 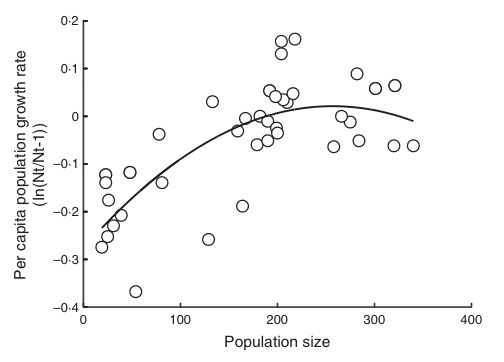 A clear Allee effect in this population is shown in the figure below, from a study by Justin Brashares (UC Berkeley), Jeffery Werner (UBC) and A. Sinclair (UBC) in the September 2010 issue of the Journal of Animal Ecology. At the right side of the curve, decreases in Vancouver Island marmot population size resulted in a higher per capita reproductive rate. But at a certain threshold (around 200 marmots), the curve turns downward, with a decreasing reproductive rate with decreasing population size. This Allee effect is so evident from these data that I may as well have copied this figure from a population ecology textbook. The authors wanted to explore what changes in the marmots’ behavior caused this decrease in reproductive rate. What exactly prevents these animals from reproducing effectively and recovering their population? They collected data on the marmots’ activity budgets (where they spent their time) for comparison with a similar set of data from the 1970s. They also used similar marmot species for comparison, as they only diversified 10,000 years ago. They first looked at the modern home ranges of the marmots compared to other closely related species. As they are colonial animals, marmots don’t frequently leave their burrow, and do so on a daily basis only to forage. Males will leave to seek mates at other burrows, but historically burrows have been very dense and thus the males would not have to travel far. 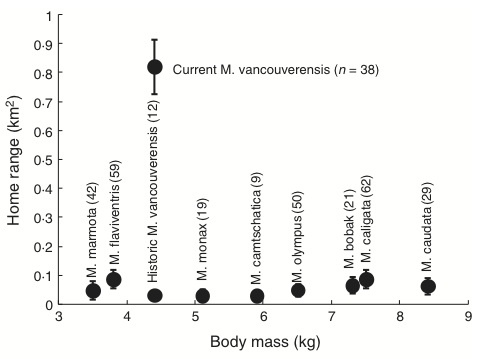 As shown in the figure below, the Vancouver Island marmots have a modern range ten times larger than any other social marmot species. This increase in travel and distance from their colony increases their exposure to predators, as they no longer have the alarm calls and protection of their colony. The authors hypothesize that the marmots have increased their range due to a lack of mates nearby. Thus the very process of increasing their reproductive rate is hindered because they cannot find mates, and when they go looking, are more likely to be killed by predators or get lost in unfamiliar territory. The authors also observed drastic changes in their social behavior. Compared to historical Vancouver Island marmot behavior and that of other related species, the modern population spends far more time on watch for predators (nearly two-thirds of their above-ground time! ), as predator populations have increased since the 1970s. But despite these efforts, far fewer alarm calls were heard per animal, indicating that there are still not enough animals to properly stand watch for the colony. By spending so much time on watch, they lose time for feeding, risking starvation, and forcing them to go into hibernation later, risking freezing to death. Time in the burrow also increased, perhaps in an attempt to hide from predators and rest from the constant vigilance and lack of energy from decreasing foraging. It’s a sad picture these authors have shown us. These social rodents are travelling far distances alone in search of a mate, and spend most of their active time watching for predators instead of foraging for themselves and their offspring. So hungry! So cold! And despite all this effort, their reproductive rate continues to drop! Is there any hope? I have long been a critic of zoos because I didn’t see how their conservation benefits outweighed the impacts of captivity on the animals kept there. But this is why they are important. The key is to keep a certain wildness in the animals so that, if their population does drop low enough to show an Allee effect, we have some hope for adding more animals to the population to help save the endangered species.